This Dihedral Burin was found on the Termo-Pialat site in southern France. This Upper Paleolithic Aurignacian site is located in the Couze Valley in the Dordogne region less than a mile west of the now famous Combe-Capelle site. The term dihedral, as it applies to a burin, is a descriptive word that interprets the shape of the working end. The chisel edge is formed by removing two flakes that form two intersecting planes. Burins were developed during the Upper Paleolithic period for shaping implements made of antler, bone and ivory. This burin was made from a blade that was struck from a prepared core. Three blade removal scars show the uniformity in which the blades were being struck from the core. This blade tool shows evidence of heavy use on the bit. 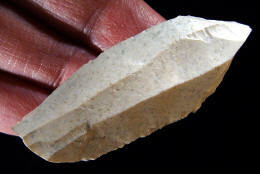 It was made from a very good quality white chert and it measures 2 7/16 inches (6.2 cm) long and 11/16 inches (2.3 cm) wide. The Aurignacian is known for its heavy use of a variety of different stone tools made from blades driven off prepared cores. 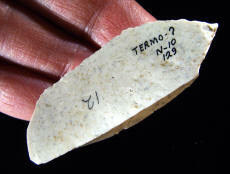 This is an excellent example of a multi-purpose tool from the Aurignacian stone tool complex. This combination Burin-Scraper shows no signs of heavy use wear. It may have been reduced to its present size from previous resharpenings. This combination multi-purpose tool could have been used for scraping, cutting or engraving. 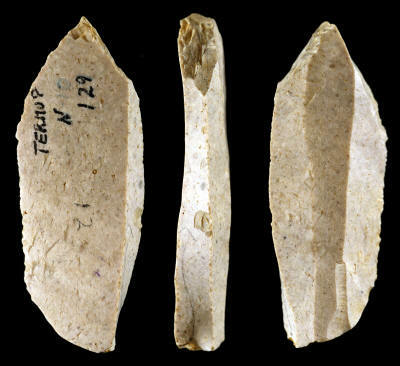 Burins were commonly used during Upper Paleolithic times. They are fairly rare in the archaeological record in North America. The chisel-like working edge is created by driving a flake off the thickness of an edge. These tools were used for engraving materials like bone, antler, ivory or wood. The Aurignacian stone tool complex extends over much of Europe. It dates to the early part of the Upper Paleolithic between 34,000 and 29,000 years ago. Aurignacian sites are known to have existed during a period of very cold and dry climate. The Aurignacian type-site is Aurignac, which is located in southern France in the region of Haute Garonne. 1970, "Tools Of The Old And New Stone Age," Jacques Bordaz. 1973, "Le Malpas Rockshelter," Anta Montet-White. 1988, "Encyclopedia of Human Evolution and Prehistory," Ian Tattersall, Eric Delson and John Van Couvering.